PORTEmaus: Thank You Celluloid Merchant For Placing Something Truly Wonderful in Front of Me Peepers... Best Films of 2010. Thank You Celluloid Merchant For Placing Something Truly Wonderful in Front of Me Peepers... Best Films of 2010. It took a lot of internal dialogue to decide which was the better film of 2010... 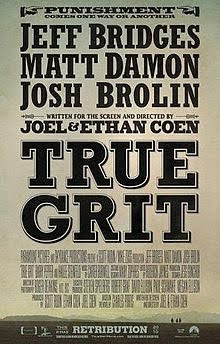 True Grit or Inception. They were both well-written, acted, expertly directed and had the amazing cinematography talents of Wally Pfister and Roger Deakins but the coveted PORTEmaus rating has to go to True Grit. Honestly, in the immortal words of a close friend, Westerns are beloved because they are "Celluloid Awesome..." Truer words were never spoken. What put it over the top were the performances of Bridges, Damon and the amazing portrayal of Mattie Ross by Hailee Steinfeld... A girl noted for role in K-Mart's "blingatude" series of commercials. Go see it and enjoy yourselves... To my wife, I am going to strap you to a chair to watch it! Mark my words.